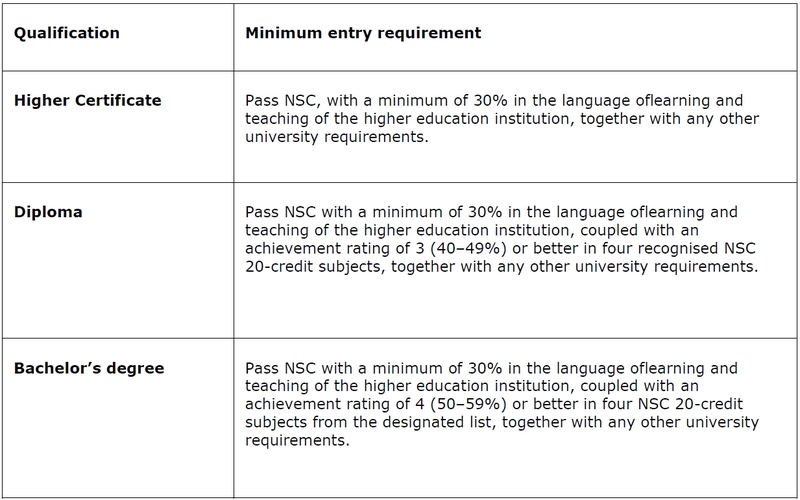 The table below explains what you need to achieve to meet the minimum entry requirements for each type of qualification. It is important to note that the table refers to minimum statutory entry requirements. The university may add additional requirements for specific programmes. requirements does not necessarily guarantee admission to any programme or field of study at NMMU. While NMMU is committed to multilingualism, the predominant language of learning and teaching is English. The statutory language requirements can be met by obtaining a rating of 3 (40-49%) or better in English, Afrikaans or isiXhosa as a home or first additional language. If you are indenting to enrol for a degree programme you need to ensure that four of your seven subjects are from the designated list and that you obtain at least a level 4 (50-59%) in each of them. You will notice that the list already includes three of the four compulsory subjects required for obtaining the NSC, namely two official languages and Mathematics or Mathematical Literacy. 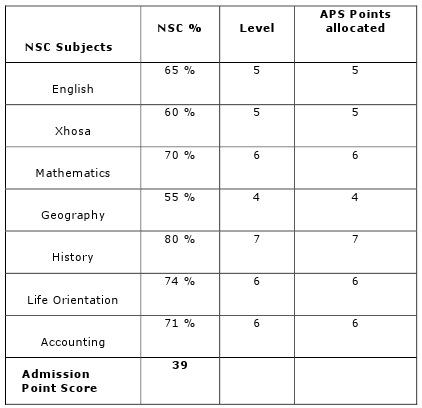 All seven subjects irrespective of whether they are from the designated list are used to calculate your APS. 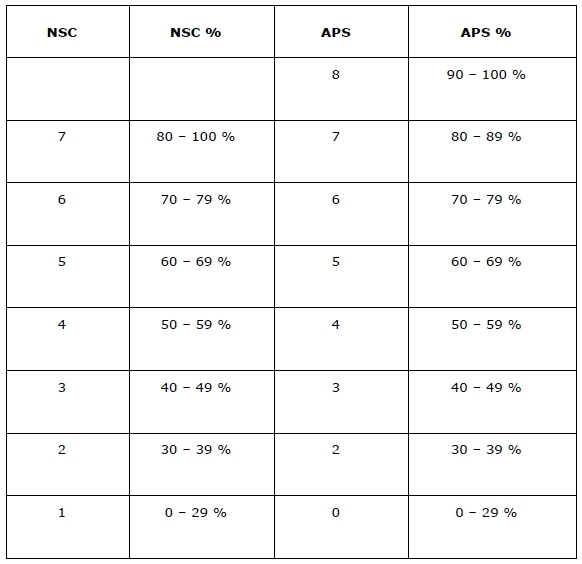 The APS system allocates point values to seven NSC subjects. 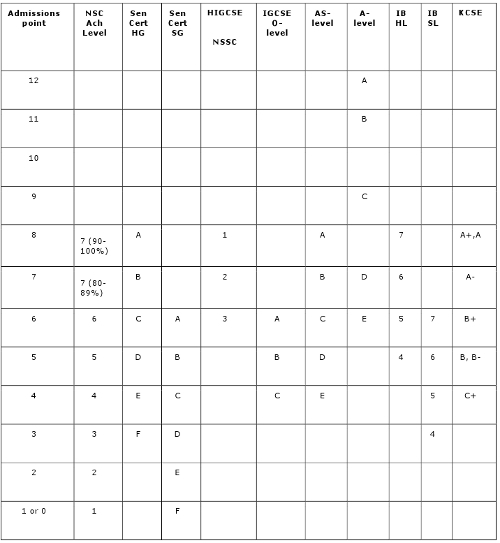 Write down your relevant grade 12 subjects and the levels you have obtained. Allocate points according to the table below. Add up the number of points you have scored for all seven subjects. If you have eight or more subjects, use Life Orientation + your six best other subjects to calculate your APS. Compare your APS against the minimum APS required for the qualification you wish to apply for. If your APS is lower than the direct admission requirement set for a specific qualification refer to the testing band range to determine if you score falls within the range to be referred for an access assessment test. Include Life Orientation (LO) when you calculate your APS. In order to apply for an undergraduate qualification, your Admission Point Score (APS) must either meet the direct entry requirement or fall within the testing band indicated. If your APS score falls within the testing band you may be referred to write the Access Assessment Test before a decision is made whether to admit you to that qualification. However, if your APS falls below the testing band you will need to consider applying for an alternative qualification. To enrol for a national diploma in journalism you need an Admission Point Score (APS) of at least 32, as well as a NSC pass in English on at least level 4 (50-59%). The applicant has met the minimum requirements for admission to the National Diploma (Journalism). To enrol for the BCom (Accounting for Chartered Accountants) you need an Admission Point Score (APS) of at least 38, as well as four subjects from the designated list and a pass in Mathematics on at least level 5 (60-69%). 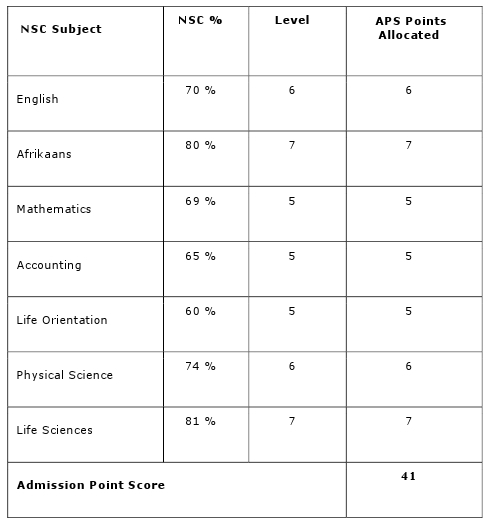 This applicant has met the minimum admission requirements for the BCom (Accounting for Chartered Accountants). If you are informed by the admissions office that you are required to write the access assessment test, it means the university wishes to assess your potential for the programme of your choice. NMMU wants you to succeed by ascertaining from your test results where you are likely to have the best chances of being successful. You are responsible for contacting the Centre for Access Assessment and Research (CAAR) which oversees this process. Their specially-trained consultants will answer your concerns and assist you in the way forward. Contact them on 041 5042918 to make your booking. Mathematics: This is required for certain programmes. Only performance in the core Mathematics topics (papers 1 and 2) will be used when making admission decisions. However, school learners are encouraged to also take the optional Mathematics topics. In certain programmes, applicants who have Mathematical Literacy instead of Mathematics may be admitted to a programme where Mathematics as an entry requirement has been set. In this instance, additional modules may be added to the programme, which may extend the length of the programme. 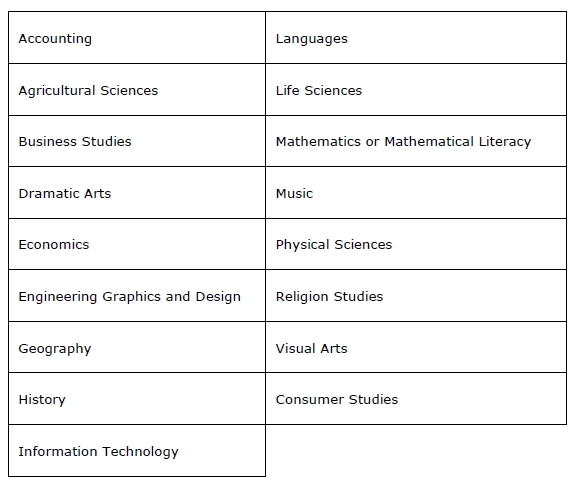 Mathematical Literacy: In view of the importance of quantitative literacy for success at higher education studies, a minimum of a 3 (40-49%) for Mathematical Literacy is preferred for likely success at Higher Certificate and National Diploma programmes and a 4 (50-59%) for likely admission to degree programmes where Mathematics is not a requirement, unless otherwise indicated. South African applicants with international school-leaving qualifications will be adjudged according to the School Performance Score (SPS). The applicant will have to comply with the minimum SPS set for the programme applied for as well as any other additional subject requirements. An applicant is required to obtain a minimum of 40% for English, Afrikaans or isiXhosa at home or first additional/ second language level. Applicants may also be required to write the Access Assessment Test before a final decision is made. To calculate your SPS use the symbols/achievement rating/percentages obtained in your school-leaving examinations in order to convert them to an equivalent achievement standard on the National Senior Certificate (NSC). A-Level – Advanced level. An A-level represents a year’s extra study beyond AS level and is regarded as worth double the points awarded to an equivalent AS grade (i.e., 10-16 points on an 8-point scale) in many instances.